Peach Streusel Muffins. My daughter loves peaches so I thought I would make her some peach muffins. Streusel muffins to be exact. 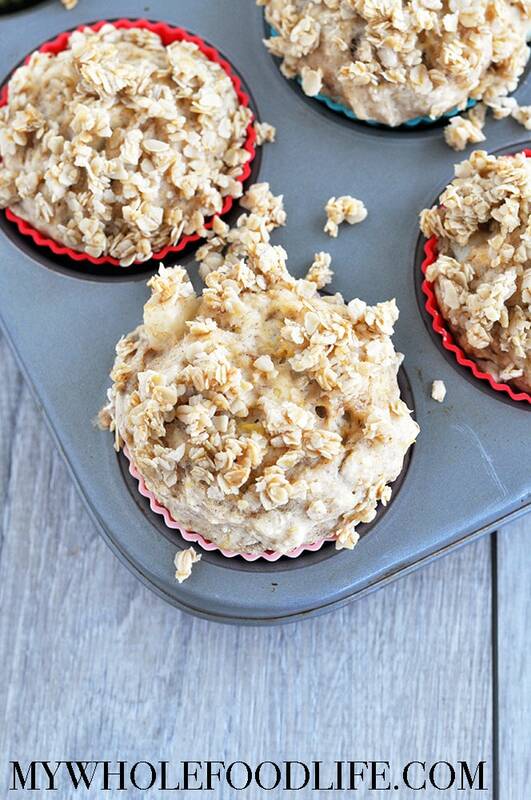 Because muffins are always better with a streusel topping right? 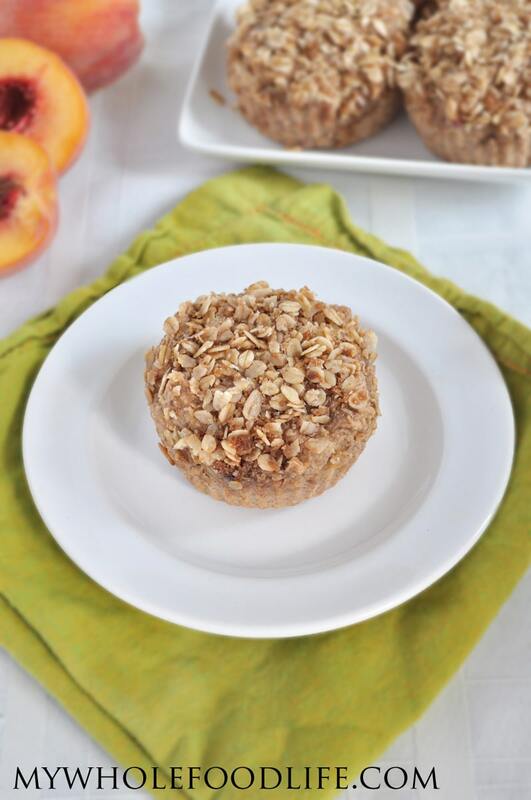 These peach streusel muffins are made healthier. In fact, the muffins itself has very little added sugar. I used diced and pureed peaches to sweeten these. 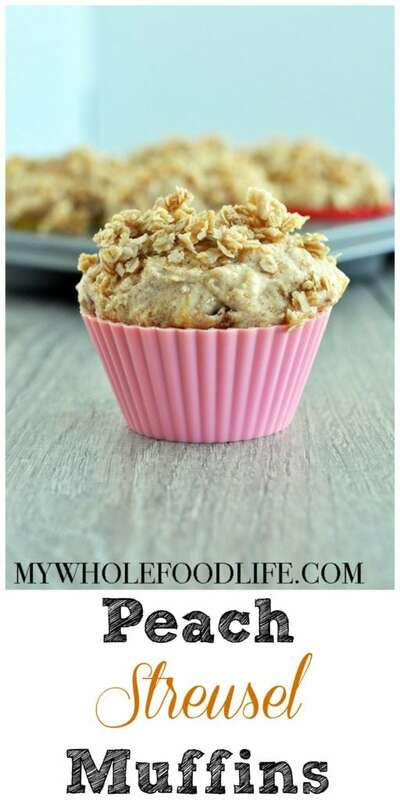 The peach puree also kept these muffins super moist without the need for oil. If you like these muffins, you may also like these and these. Want to make this recipe? Watch the video. For more videos, you can subscribe to my YouTube channel. 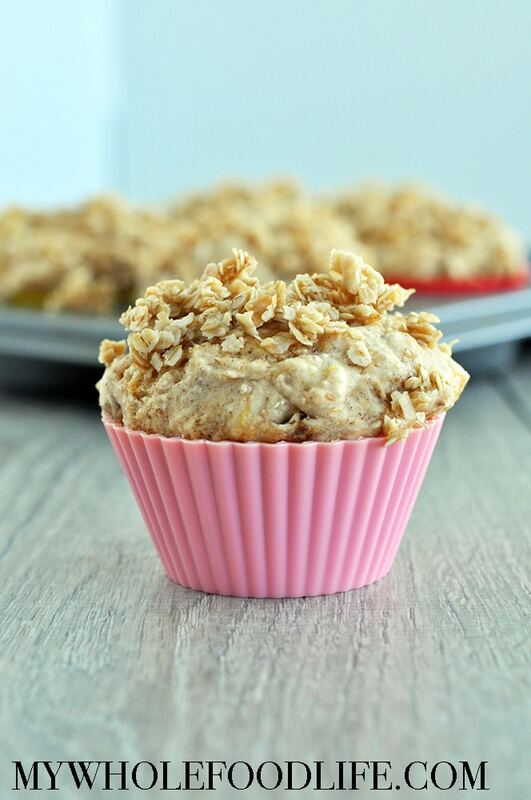 Peach puree helps keep these muffins extra moist and delicious! In a small blender or food processor , puree 1 of the peaches. Dice the other peach with a knife. Spoon batter into lined muffin cups. I used silicone muffin cups for mine. If you are using paper liners, then you might need to grease them. I had a few people say that the muffins stuck to paper liners. To make the topping, mix all 3 ingredients in a blender or food processor. Just pulse enough to get them to clump together. You may even be able to mix them by hand. Once all the batter is spooned into the cups, add the streusel topping to each muffin. I gently pressed the topping into the tops of the muffins so it would stick. If you are making standard sized muffins , bake for about 12-14 minutes. If you are making jumbo muffins bake for about 20 minutes. Use a toothpick and check to see if it comes out clean. That is how you will know they are done. Store these muffins in the fridge or freezer. They should last at least a week in the fridge and much longer in the freezer. Enjoy! This looks so good . Just purchased a case of peaches and I can't wait to try the recipe. Love you recipes! Thanks! I made these this morning and they are delicious. Unfortunately, mine stuck to the paper muffin cup liners, but I am enjoying what I can break free!! I made these this morning. Very easy and they are great. I think I will try real eggs next time just to see the difference and add some protein. Thanks!! You're welcome Amy! Glad you liked them! Do you think I can make these subbing the almond mill flour (from almond milk) for part or all of the oat flour? I'm not sure. You might be able to use some of it, but if you try all of it, you will need to add more eggs. I made them with half almond pulp (ground into flour) and oat flour. Absolutely perfect and yummy! Thanks!! Your recipes are the BEST! Thank you! Good to know it worked with pulp! I made these muffins tonight and OMG! These were so amazing! The texture was perfect, just the right amount of sweetness. A wonderful recipe for sweet summer peaches. My only complaint... I'm gonna eat the whole batch by myself!!! Thanks for a super easy recipe that will become a staple at my house. You can definitely try pureeing both fruits. Not sure if they would work as donuts, but if you try, let me know. Would these work for mini muffins and any idea of the cooking time? Thanks! Yes. Cooking time would be less. Maybe 1/2 it? I'm sorry I don't, but I think you can sync my recipes with My Fitness Pal to get that information. These are dense thick muffins with little taste....I made them twice to be sure I followed the recipe to a t. I am super disappointed that I wasted the time and ingredients to make these...TWICE!!! Please modify your recipe to be fluffy and taste good! I am sorry you didn't like them, but they are a huge reader fave. I do understand not every recipe will be a hit with everyone. Do you think your baking powder could have been old? Hi - I have frozen sliced peaches in my freezer from the summer and wondered if you could estimate how many cups I would use to approximate the 2 peaches you use? Thanks! If I had to guess, I would say 1 1/2 cups? What type of oil would you substitute in the struesel topping? Unfortunately we have a nut allergy over here so I avoid coconut oil. I don’t know how I missed this recipe! My four year old daughter and I make a batch of one of your muffin recipes 1-2x a month. You make life sweet! Thank you!